Medianizer will put your collection of videos, music, games, and books in good order. The program can simply scan folders on your computer / network and create an easy-to-navigate catalog of all items - with covers, photos, filmographies, discographies, etc. Have plenty of Blu-rays, DVDs, paper books, vinyl records? No problem, Medianizer will take care of them, too. It handles various types of media in the same way, be it files, removable media like CDs, or non-readable by computer things like paper books, vinyl records, etc. You have a collection of movies in video files, on DVDs, Blu-rays, and want to watch something with your family. 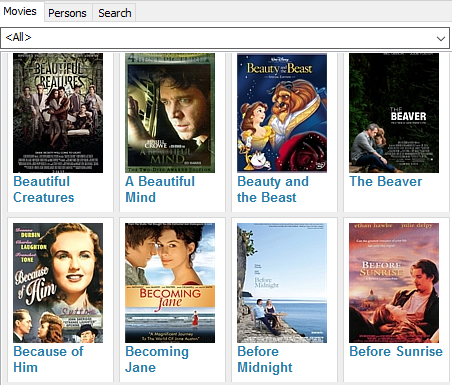 But which movies are suitable for your children? Do you need to enter each title manually and search for parental rating on the internet? Well, just start Medianizer and set your requirements - for example, comedy, PG-13, unseen. The program will display a list of all movies from your collection that match the criteria, and you can check their details (description, cover, shots, cast and crew, and so on) to make a decision. The above scenario suggests that you have already added your movies into the program and downloaded information about them from the internet. There are several ways to do that. For video files, the easiest one is to scan folders for media. 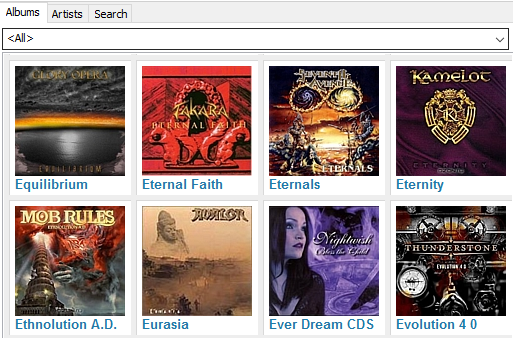 Medianizer also helps you learn more about the music albums you collect. It can download covers, reviews and other details from the internet. The program shows how many albums of a particular artist you have, where exactly the albums are stored, whom you gave your CDs in the past, and so on. Information about artists may also be interesting. Medianizer is capable of downloading such details as: complete discography, photos, biography, band members, and more. If your music albums are stored as files on a local or network drive, you can easily play them directly from Medianizer, or create an illustrated music catalog for such popular hardware media players as Dune HD. Books are managed in the same way as movies and music. Medianizer supports e-books, audio books, paper books, and pretty much every other type of books that you can think of. E-books and audio books can be added automatically - just scan for media in the corresponding folders. Paper books are to be added by title or by barcode. Medianizer can download information about books and authors, including such details as biography, bibliography, photos, book summary, contents, etc. Furthermore, it offers a program to read e-books conveniently on your computer and a built-in player to listen to audio books. Have an e-reader device like Amazon Kindle? 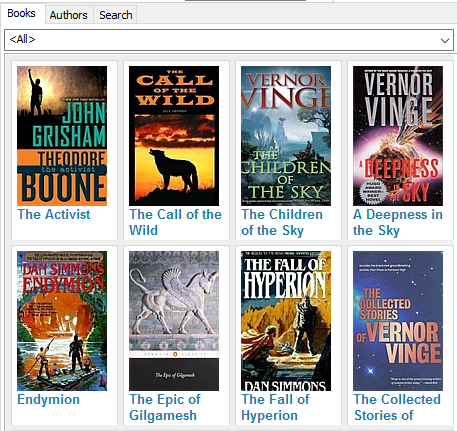 Medianizer will help you select books and copy them to your e-reader in just a few clicks. All most popular devices are supported. Medianizer 10 further extends capabilities of the program. Now you can organize your video games just like you organize movies, music and books. The game organizer also downloads all relevant information about games from the internet, including covers, screenshots, genres, ESRB rating, and more. 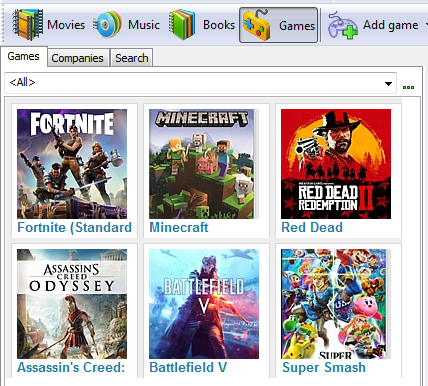 You can easily select games by genre, setting, or platform, download information about the developer of the game (company), mark games as completed, sort and search them in different ways, create reports and diagrams. To learn more about the developer of some particular game, just click its name and hit the "Download" button. Medianizer will download details of the company, including its history, facts, logos, and the list of games developed and / or published by the company. 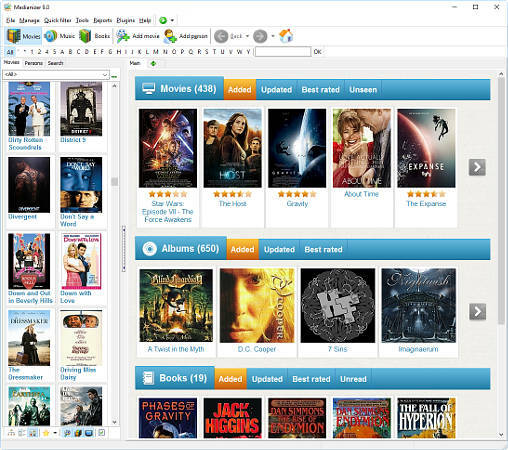 Organize your movies, music, games, and books easily with Medianizer!